bestmom2 Loved these! My daughter turned 2 and loves cows! Fit the theme perfect! Cutest farm collection I came across! Orion I love the little cow print, he is so adorable! If you get the plates, get some reinforcements. These are a bit flimsy, although they didn't leak and break through. We had brisket and beans, (juices-a-flowin') and they held up. But you had to hold them with both hands or they would have just folded on you. Cute though! Kia25 This is the cutest farm theme around! I also got the cups and the cow balloons, which are also adorable. I bought small bails of hay and I'm going to make a balloon arch in the shape of a barn to compliment the theme. Celebrate Express never let's me down! ItsTerri This is the cutest farm theme around! I also got the cups and the cow balloons, which are also adorable. I bought small bails of hay and I'm going to make a balloon arch in the shape of a barn to compliment the theme. Celebrate Express never let's me down! nkroping My youngest loves being at the barn around all the animals! So I knew that I wanted to have his 2nd birthday at the barn & have a barnyard bash! I looked every where & this is the CUTEST stuff I could find! I LOVED it!! The plates were awesome quality! & just the cutest!! Everyone loved them!! & I loved how it said 2nd Birthday on it! I buy all my supplies from here! littlebit1413 VERY CUTE and adds to the overall theme of the party. Plates were pretty durable and a good size for food and treats! ProudMomma21 These plates were so cute, but not too babyish! I used them for my son's 2nd birthday and they look great! Mommy325 These plates are so cute...the cow on them is adorable. Would definitely recommend them to anyone. sleeplesmamainseattle I was so surprised how durable the plates are. They are also super cute. 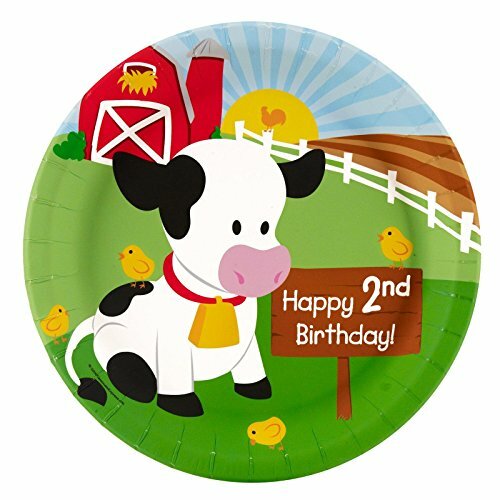 The colors just pop, the cow is the best, and they are personalized for second birthday. Everyone loved them, especially the kiddos. Hdschreiber427 I fell in love with this barnyard theme party supplies because they were so darn cute. The picture does them justice because they just as cute or cuter in person. I loved this barnyard theme. Includes (8) 9" dinner plates.